Welcome Dear Readers! This weekend’s 33-word Trifecta Writing Challenge is as follows: Give us a thirty-three word piece that has a color in it. Use the color to describe anything you like, or use anything you like to describe your color, but keep it creative and keep it short. 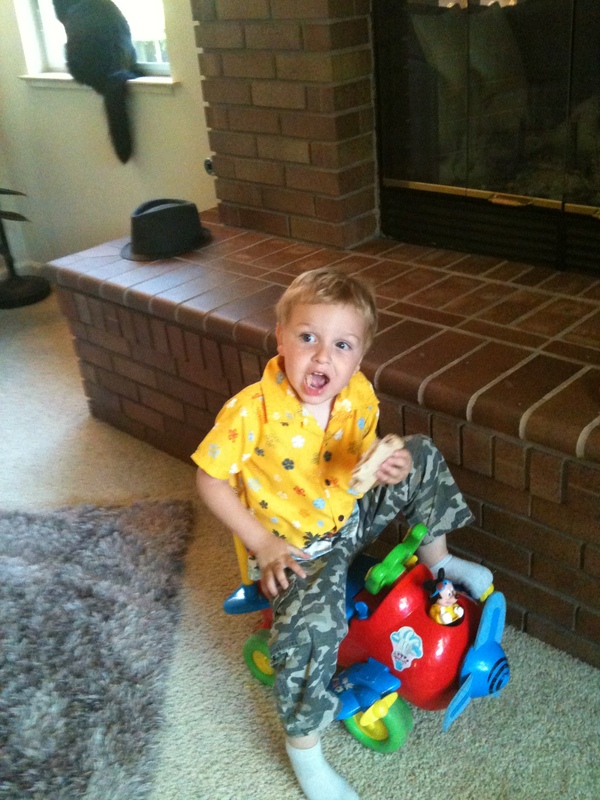 I chose this colorful picture of my grandson, Clayton, to write about today. I love this!!!!!! The ending is perfect! This is a funny picture! When was this taken? So glad you liked it honey. I picked it because of the colors he was wearing, but the hat and the kitty in the background gave it some added dimension. It seems like it was taken about 9 months ago. He was still little enough to fit on that airplane. It was around the time he made that airplane his favorite toy again. Could it have been a year ago? No!!! Time is going too fast. This is my kind of poetry, short & sweet! Ah Thanks Benze! It always surprises me though on these 33 word challenges how long they end up taking me! Ha! Adorable and sweet, and the rhythm and rhyme are sublime. I’m agog Draug — you rhyming dawg! A mellow little yellow fellow! I love this poem so much! Clayton’s outfit is hilarious and such a boy thing!! It is hilarious! Currently he’s into wearing t-shirts that are way too small and he usually has his jeans on backwards when I go over there. Nikki says he likes to wear them that way. Well at least he’s dressing himself. so fun! What a playful (and colorful) poem! I wasn’t sure whether I felt up to the challenge or not, but then I noticed the upper left of the photo and got a bit of inspiration. I just happened to come back to my computer now and MS Word was still open, so I noticed I used “frown” twice–hence, the rewrite. OMG! Thank you so much for sending this clip!! LOL! This commercial is nothing short of a masterpiece. I think there’s a little Martin Scorsese’ in all of us writer types. (Good luck with your revision!) HA! So close, yet so far; black cat frowns. Somehow I had the impression that everyone was supposed to write a 33 word rhyme. These challenges are ones you make for yourself? Not sure I’m understanding this. Every week there is a prompt word which is always the third definition of a word provided by the editors who run the site. Writers are asked to write between 33 and 333 words in any form they want — using the prompt word in their response. Then the entries are judged by the editors and they pick a first, second and third place and announce them on Fridays. On Fridays, the community judged week-end challenge is posted where writers are usually asked for a 33 word response to various challenges which are explained by the editors on Friday. The community links up their entry, then goes back on Sunday night to vote on their favorite entries and then first, second and third places are announced on Monday along with the new 33-333 word challenge. You can write any thing you want in any form you want as a response. You should give it a whirl, Donald! Frankly, I’ve never trusted camouflage. Very cute Linda! A great looking little fellow. Fun. Thank you so much for coming by. Glad you liked it and the pleasure was min LaTonya! Brilliant! Cute little guy too! AWWW!!! So adorable I smiled and almost teared up, heh… I love this! This was wonderful! Looks like a kid with lots of personality! Clayton definitely has a flare for fashion. He is adorable. Thanks Tara. He’s quite fashion forward. That last line has a very Shel Silverstein feel to it. Love it. He’s a pint sized rainbow on wheels! Clayton is adorable, and so are your 33 words! Ha ha! You are so right Janna. He’s such a “guy” about his clothes already. Cute! Are you hinting at something more about the pants that would need camo (potty training not withstanding)? LOL! I think you just stumbled onto a moneymaker, Joanne! Camouflage pants for “accidents” HA! I love it! This is adorable (as is your grandson). 🙂 Love the fun tone and the ending. Great job with the prompt! The camouflage rhyming problem reminds me of a short book I used to own called “There is no rhyme for silver.” Your poem was fun; serious poetry doesn’t resonate with me. I almost groan when its time for the poets in our writing group to read their work.